of the Mask-erade Online Card Class. This class was taught by Jennifer McGuire. we used a large mask and small stamps. 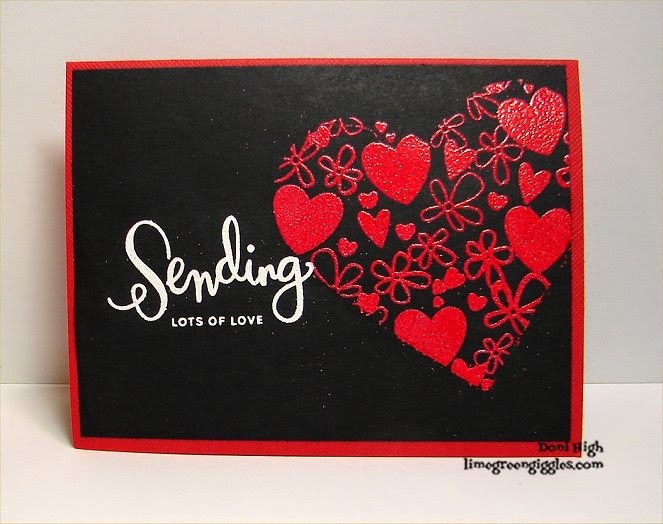 I used candy red embossing powder and detail white embossing powder. Your card turned out awesome; I love the way the red jumps off the black!! Great card! Love the red on black. Oh this is so striking with that embossed red on the black Doni. Love it. Those colors pop right off the page! Great job! A heart filled with hearts! This made a really striking card! Beautiful black and red card. So striking. Love your card Doni. I'm taking the same class. Learning so much! 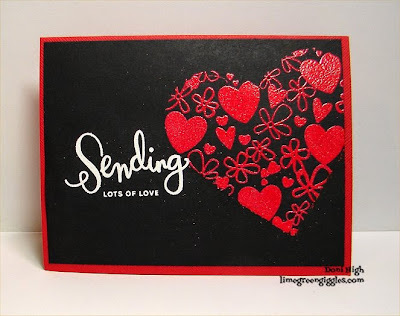 Awesome card, love the red, black and white. WOW what a striking and fabulous card. This is a WOW card!